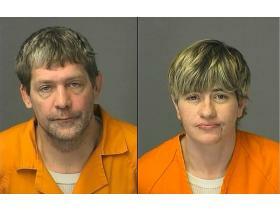 Christopher Fried Hahn, left, and Cathy Ann Hahn were arraigned Friday and both received $30,000 cash bond for taking off in a Washtenaw County patrol vehicle Wednesday. Jan. 23, 2010 · 8:40 a.m.
At approximately 12:30 a.m. Friday, WCSO deputies were dispatched to the 1500 block of Harvest Lane in Superior Township for a burglary. Entry was gained by kicking in the back door. One Panasonic TV, one Sony Play Station 3 console and games were taken. This investigation is on-going. At approximately 10:20 Thursday deputies were dispatched to the 2300 block of Ellsworth Road in Ypsilanti Township. It was reported one subject struck an acquaintance in the parking lot with his vehicle, and then got into a physical altercation. The 18-year old Ypsilanti Township resident was arrested and transported to the WCJ. The report will be forwarded to the prosecutor. Non-life threatening injuries were reported. Cathy Ann Hahn and Christopher Fried Hahn were arraigned Friday and both received $30,000 cash bond for taking off in a Washtenaw County patrol vehicle Wednesday. The incident started at approximately 5:00 p.m. Wednesday when a sheriff's deputy was dispatched to the 100 block of Chestnut Blvd in Scio Township for a family trouble in progress. It was discovered the dispute involved the living arrangements of two family members. It was decided the Deputy was going to transport the two family members to the Deloris Homeless Shelter in Ann Arbor City. They both were placed in the back seat of the patrol car to await transportation while the deputy completed his investigation. At approximately 5:45 PM it was discovered the patrol vehicle was taken from the above residence. A short time later the vehicle was located and the suspects were arrested without incident. Pretrial has been scheduled for February 4, 2010. At approximately 3 a.m. Thursday Washtenaw County Sheriff's Deputies were dispatched to the 1000 block of Woodglen Street in Ypsilanti Township for a stolen vehicle. It was reported a 2006 blue Hyundai Sonata was taken from the above address, when it was left unoccupied while warming up. The suspects are unknown at this time. At approximately 1:30 p.m. Sunday, WCSO Deputies were dispatched to the 1300 block of Rue Willette Blvd in Ypsilanti Township for a burglary. Entry was gained through the rear sliding glass door. One 38-caliber handgun in a gun pouch, one grey Play Station 2 with games/controllers, and one XBOX 360 Arcade game was taken. Suspects were identified as two black males with large black puffy coats. Both suspects were located during another burglary Monday when deputies were dispatched to the 2600 block of International Drive in Ypsilanti Township for a burglary in progress. It was discovered two subjects fled from the location taking one XBOX game system, a laptop computer, and shoes. As the investigation continued Deputies located both suspects at a nearby apartment complex. Jalen Kaevon Hughbanks and Troy Anderson Lewis were arrested and transported to the WCJ. They both were arraigned Wednesday and remanded to the WCJ on 2 Counts of Home Invasion. Bond was set at $15,000 cash per charge. At approximately 9:30 a.m. Monday, WCSO Deputy Blanchard conducted a traffic stop on Tuttle Hill Road near Textile Road in Ypsilanti Township on a suspect vehicle listed in a burglary that occured Jan. 12 on the 7200 block of Bellemeade Street in Ypsilanti Township. The suspects are believed to have taken one Laptop computer, miscellaneous jewelry, video games and sunglasses. Both occupants Henry Lee Brandon, and a 15-year old Ypsilanti Township resident were arraigned Wednesday on Home Invasion Charges. They were remanded to the WCJ and Juvenile Detention Center on 4 Counts of Home Invasion II charges and received a $15,000 cash bond per charge. 1. Home Security Surveys: We will come out and walk through your residence with you, offering security information tips within your home. Email me if you are interested in this service. of NHW meetings in your area. 3. Email Alert System: To sign up, visit our website at www.washtenawsheriff.org click on the Township you would like to receive crime reports about and enter your email address.